Where is everyone? Attrition rates in call centres. Anyone who has worked in a call centre for any length is sure to have experienced something not dissimilar to this; It’s the moment you look around and realise that you don’t recognise anyone anymore. The ones in your training group who you stuck with like glue in your first few weeks, the others who helped you out of a sticky situation when you didn’t know what button to press, the ones you always nodded at as you passed them in the corridor, or the one you always chatted about the weather in the canteen as you waited for your super-noodles to cook in the microwave. They’re gone. All gone. 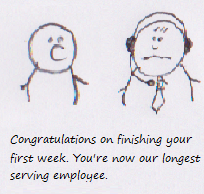 Staff-turnover is legendary in the call-centre industry. Anecdotaly one call centre’s turnover is said to exceed 100%, while a survey of 142 UK call centres carried out in 2001 found a mean average annual ‘quit rate’ of 13% with the bottom 10% of call centres experiencing quit rates of between 28% and 82% – though the authors point out that for half of the call centres in their sample the rate is 8% and below. More recently however, industry analysts Contactbabel put the mean average attrition rate at 26% for 2011, based on a study involving 208 UK call centres, predicting that this figure is set to rise further with outsourcing, retail, services and telecoms as having some of the highest attrition rates. To put these observations into some sort of context XpertHR report that the median ‘voluntary resignation rate’ for the UK, across all sectors, was 7.9% in 2011.
satisfaction with the intrinsic aspects of the job (the nature of the job itself) is much lower for call handlers than for other benchmark occupational groups and for other work roles within the call centre. But much more than that, working in a call centre is bad for your health. They add that…. the risk of mental health problems is higher for call handlers and job-related well-being is lower compared to benchmark groups of employees in other occupations. The researchers also found that wellbeing was lower among agents who worked in the telecoms or IT business sectors, in call centres of over 50 employees and where staff followed strict scripts and had performance measured either constantly or rarely. Higher levels of stress were associated with high-workloads, not being able to make full use of skills and conflicting role demands. we embrace churn because of its inevitability. In the main, call centres are stopgaps, leading to something else (university funding, in-between jobs, university leavers unsure of direction, etc). This was very much the view I have encountered across the industry wherever I have worked. Even among the senior managers you’d get the impression that the expectation is that you will leave. It seemed strange in my last place as with so many clients and systems it took around eighteen months to become proficient to the level that you were hitting call-time targets and providing a reasonable level of customer service – yet, in large part because of their attitude, there was no chance to progress, or to develop in any way. It is unrealistic to expect an agent to spend every available minute talking on, or wrapping up a call. You would see steam coming out of their ears in no time! They need breaks, lunch, training and breathing time between calls. If you push too hard on this one (usually called occupancy, utilisation or productivity) then you find an increase in absenteeism and attrition (people leaving). So in a way it becomes a self-fulfilling prophesy. Managers expect staff to leave so offer them no incentives to stay and in the meantime take a short-termist approach of squeezing every drop of productivity out of them while they can until the staff burn-out and quit. This then re-enforces their original views about the call centre being merely a place to pass through on your way to better things. It seems an obvious question, but for me the more I think about it, the less clear-cut it becomes – just what is, and what is not a call centre? and do you have to be in a call-centre to have a call-centre job? Above all is there one single defining characteristic of the call-centre? One of my first jobs was dealing with the incoming calls for a department of a local council. There were two, sometimes three of us in the office and our job was to answer the phone and either take messages and put people through to our colleagues and people in other departments depending on the enquiry. It was a tough and demanding job, dealing with often distressed or angry callers, without having any real training in how to handle them, or any power whatsoever over the outcomes but I stuck with it as it was my first proper office job and I was eventually promoted to another role within the team at the time thinking – quite wrongly it would turn out – that that was the end of me and the phone, but the thing was I never really thought of it as a call centre job – and I still don’t. Though in many ways it seemed to have the characteristics of a call-centre job – It was almost entirely on the phone with my working pattern dictated by the rhythm of the calls coming in. A few years later when working in my last call-centre job, I reapplied for my old role which had in the meantime been outsourced to a private sector provider. The surroundings had changed drastically. It was now the classic call centre – the one you see if you close your eyes and imagine a call centre – with all the operators sat in rows wearing headsets and a display on the wall detailing the number of calls waiting. What had happened was effectively a centralisation of all the people who like me had been taking calls within departments across the council. They were still organised into different business areas, but they were now all under one roof and though the tasks were largely unchanged they had all become unambiguously call-centre jobs and the place was very definitely a call centre. In defining a call-centre there are two considerations; the tasks of the job and the environment, but can there ever be exceptions to this? What if, for instance, by way of technology a call-centre was de-centralised with operators based at home taking calls and logged in to a system remotely, could it still be regarded as a call centre? I would be inclined to say yes – so long as a final condition is met regarding the way in which workers are managed. In my old job my line-manager had been the department manager who managed a range of professionals and had little time for the specifics of managing my area. There was no specific monitoring regime, or call handling targets, but after the outsourcing the management structure became much more specialised. There were team leaders, as well as managers, who were dedicated to managing the flow and handling of calls. New IT systems were introduced which monitored, logged and fed-back and the boundaries between specialist areas were being eroded, so for example one operator could one call about bin collections and the next about housing benefit, possibly for two different councils. Out of the three elements, task, place and management it is therefore the third which is most important. The call centre comes into existence at the point where the job becomes not doing some other task, but rather becomes the taking, or making calls. Spatially cut off from the rest of an organisation monitoring and call targets become an obsession. It’s in the call centres DNA.